Since I was so pleased with how Sprout turned out (see my last post), I decided to do another-y. So, I went ahead and fished out some more Daiso yarn and more Morris Empire and got to it. 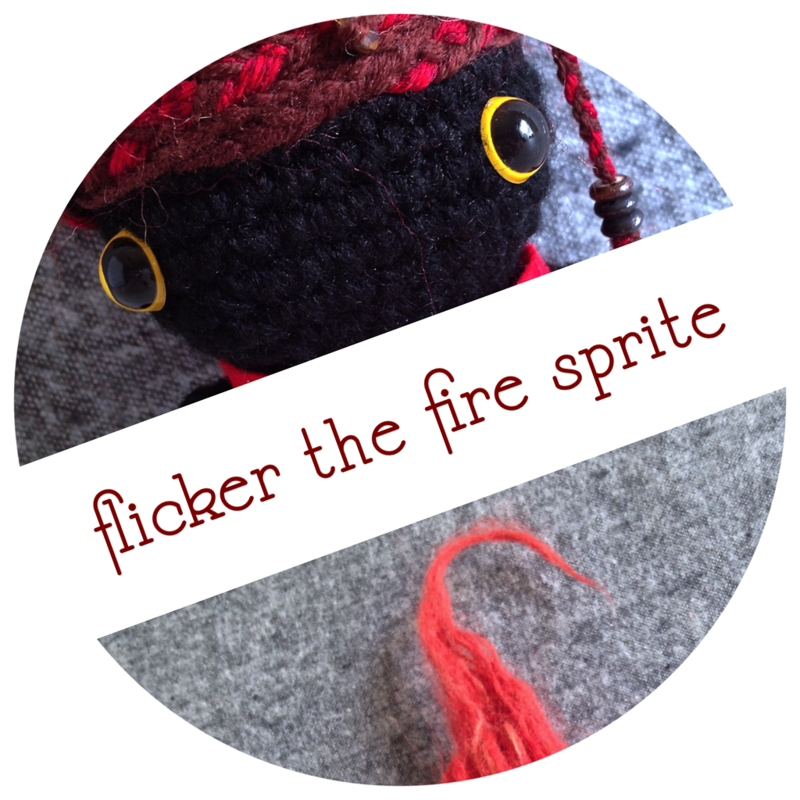 And I ended up with Flicker the fire sprite, and I think she’s pretty neat! I had some black acrylic Daiso yarn, which I thought would be fun and different to use since dark colors aren’t usually in my wheelhouse. That made me think of coal, so I decided to do a fire sprite this time. After I made the body, I wasn’t sure quite how to do the hair. I knew I wanted it to be a flame, but I hadn’t really thought about what to use. In the end, I decided to use wool roving that I have for needle felting. To prevent it from shedding everywhere or tearing off, I used my needle felting tool to really plant the base of the fiber clumps into the head. 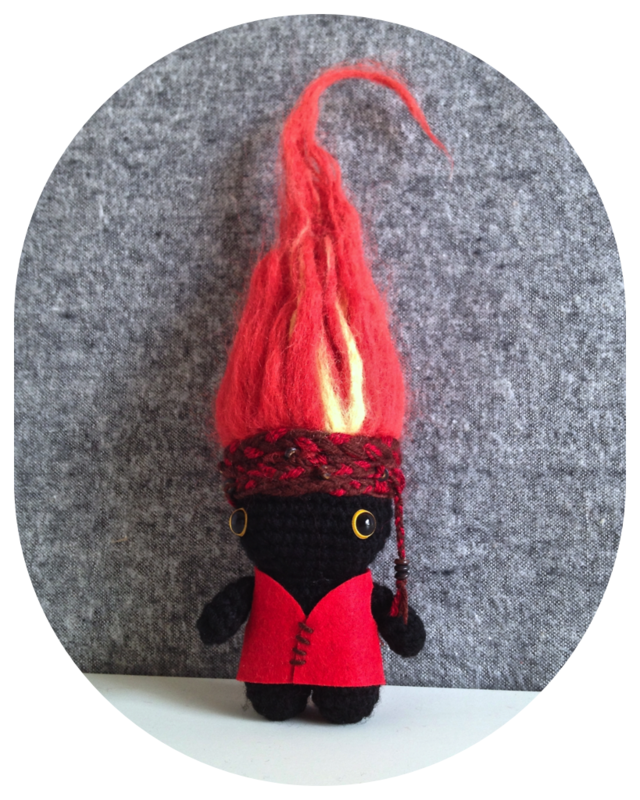 When I’d finished putting her together, I gave the entire flame a going-over with the needle felting tool just to make it stay together and not be too wispy or leave red fluff everywhere (although, that will still happen a bit). After I’d done her flame and her body, I used some Morris Empire 4ply in Clove and some 8ply in Scarlet Twist to do a squillion braids and wrapped them around the base of the flame to hide the knots where I hooked the fiber in. I found some little wooden beads and I threaded them onto some of the strands for some extra pizzazz. In case you’re wondering what my position on pizzazz is, I’m pro pizzazz. With the tails I made a little pony tail at the back, and wrapped it with a final braid (See? Mo’ pizzazz). Finally, I gave her a little tunic made of felt and fastened with some of the Empire in Clove. 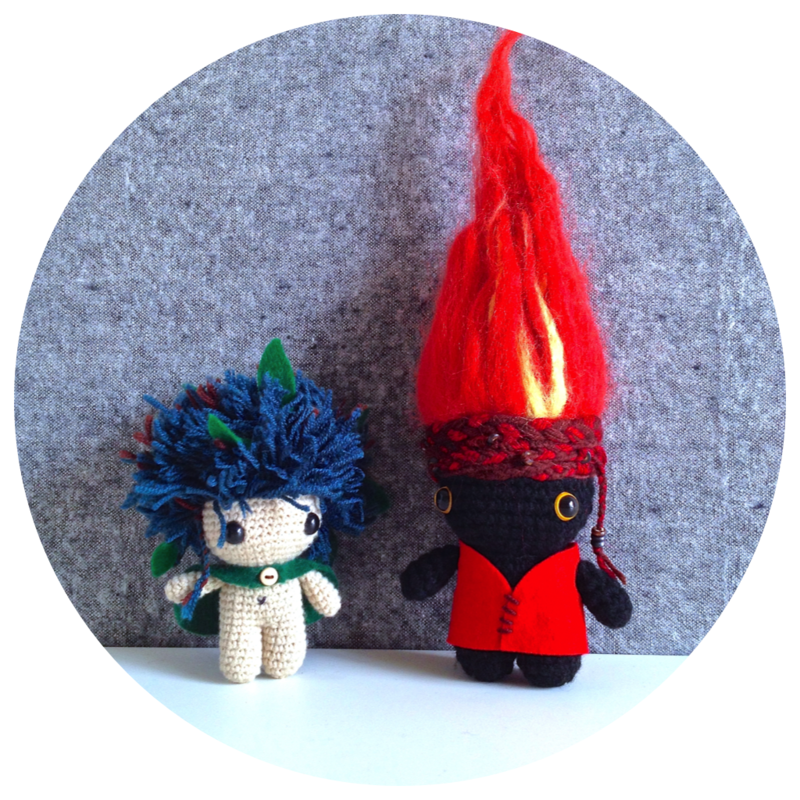 You’d think a forest sprite might not be down with a fire sprite, but I think they’re pretty good buddies. Natural order of things and all that. They’re tiiight, yo. I kinda want to do a water one next, but I don’t have any yarn that really speaks to me in a watery way, so I’ll have to come back to the sprites after a future yarn haul. I’ve been feeling very inspired by some other stuff though, so hopefully I’ll have to other craftiness to share until a new water sprite happens. If you made a sprite, what kind would you make? Would you pick an element? Or something else? Sharezies! I Made An Animal Curtain For My Bathroom! 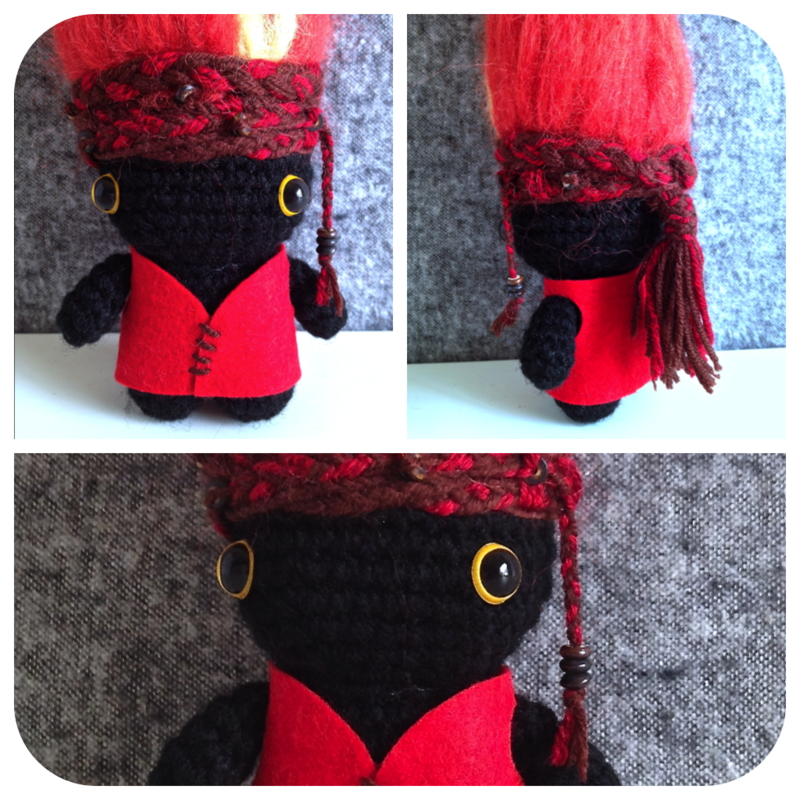 I would totally do a flower sprite… or would that then be classified as a fairy? Either way, cute and covered in little flowers is calling out to be created! You could classify it any way you like, but it would it defs be TOTALLY cute! You should do it! These are fantastic. I adore Flicker’s flame hair! It turned out so well!